Agency eServices is available free of charge to all Sabre ConnectedSM travel agents. Some optional fee-based services are available. Enjoy easy access to a range of services from our home page. Enjoy first class training without having to leave the office. Facilitated training sessions, self-paced educational modules and downloadable job aids and quick reference guides are available anytime. You can also access the online version of Format FinderSM help system. Order replacement equipment and locate step-by-step hardware and installation instructions, diagnostics and diagrams. Enjoy convenient access to your Sabre invoices and pay them online through our secure payment service. Manage authorization and access to your confidential report data to produce booking reports. Current and historical booking data is available by agency location(s), individual agents or carrier. You can also access detailed scan summary reports, software help desk call reports and more. Access support for key products and programs and learn how they can enhance the value of the services you provide to your customers. Information on products such as Sabre® InformSM mobile services, Do-It-Yourself tools, Sabre® ExclusivesSM, Sabre® MagnifySM and more is available. Promote the valuable services and travel offers to your clients with a range of easy-to-use marketing tools. A library of pre-formatted e-mail messages, assistance with co-branding opportunities, promotional databases, brochures and other valuable marketing tools available for your use. Place Sabre equipment addition, deletion or move orders or check status for any orders previously placed. Use easy-to-load players to learn more about key Sabre products through a selection of pre-recorded presentations and demonstrations. Contact your Sabre account executive or support team members through our online communication tool. You can also access call logs from our software and technical help desks to help target productivity improvements and develop training plans. News about the latest Sabre products, promotions and other hot information to keep you informed. Access tools and information identified for agencies sharing common business practices. In addition to these services, there are a number of optional programs which you can take advantage of, including fee-based consulting services and assistance for custom solutions, third-party integration needs and local area network program troubleshooting. You can also subscribe to online past date Sabre record orders or our low-cost Internet messaging solution. An Internet connection is required to use Agency eServices. A high-speed connection is preferable. You can enter Agency eServices anytime you have access to the Internet. Go to http://agencyeservices.sabre.com/ and log in with your agency information. 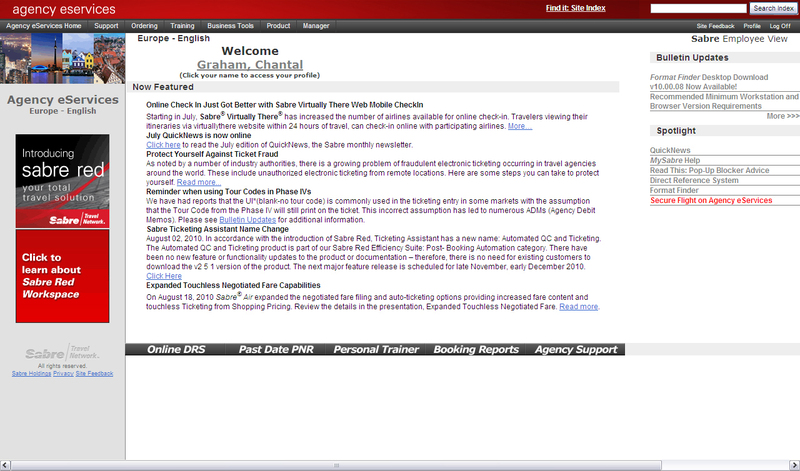 If your agency uses the Sabre eVoya Webtop, you can also access it from the Webtop toolbar.